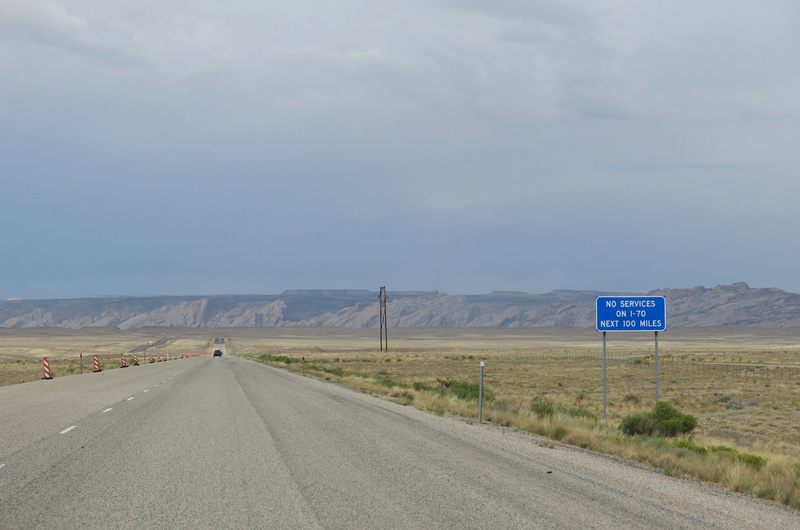 Heading west from Green River, Utah along Interstate 70, motorists are alerted to the lack of services to Salina. Photo taken 08/17/13. The 106-mile stretch between Green River and Salina on Interstate 70 is the longest on the Interstate system without any services. The longest stretch of a numbered route in the lower 48 states is the 163 mile drive along U.S. 6 between Tonopah and Ely, Nevada. Interstates 70 and 71 conclude a 1.74 mile overlap through Downtown Columbus at Ohio 315 (Olentangy Freeway) north. Photo taken 10/01/10. The numbering grid of the Interstate system includes an array of overlaps where consecutively numbered routes either intersect or overlap. 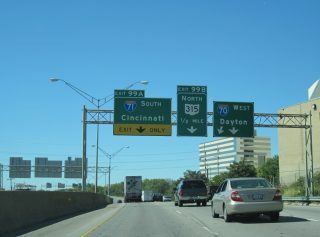 The junction of I-70 and 71 is one such in Ohio. Two others are the east end of I-74 at I-75 in Cincinnati and the overlap of I-76 and 77 at Arkon.